Osteoarthritis of the knee, allso called gonarthrosis develops as a result of poor quality and quantity of articular cartilage. Premature wear and degeneration of articular tissues occurs (articular cartilage, subchondral bone, articular fluid, joint capsule, ligaments and muscles). Because the cartilage layer is not evenly distributed over the entire surface, the load on the joint structures changes and bone restructurring takes place. Bones (so called osteophytes), which irritate the adjacent tissues and cause inflammation, are formed. As a result, dysfunction of the synovial fluid , which moisturizes joint surfaces from the inside and reduces friction, occurs. What is the degenerative knee disease characterized by? Rehabilitation is the best way to relieve pain, improve comfort of functioning. In spite of pain, it is advisable to perform gentle exercises. The process of returning to shape can be accelerated by dietary supplements rich in chondroitin and hyaluronic acid. Due to the mechanical properties of this substance it is possible to absorb forces acting on the joints. As an effect, movement is facilitated. Hyaluronic acid is the main component of joint synovial fluid, systematic replenishment of this component can improve the comfort and health of joints. Chondroitin in combination with hyaluronic acid guarantees less joint pain, reduces friction in the joint by proper hydration. Simultaneous action of both ingredients guarantees supplementation of synovial fluid and reduction of inflammation. Nordic Walking - a correct way of walking and holding sticks significantly relieves joints and globally engages the muscles strengthening their structure. Exercises in the pool with warm water affect the relief of joints, reduce pain. Water additionally provides resistance which affects the increase in muscle strength. Manual therapy - mobilization of the affected knee arthritis can faster and more effectively eliminate pain and thereby improve the function of the joint and prevent surgical intervention. Kinesiotaping - using a plaster/patching will relieve the damaged tissues, thereby reducing swelling, increasing blood flow and providing nutrients. Physiotherapy - magnetic field, laser, ultrasound, electrotherapy, cryotherapy. 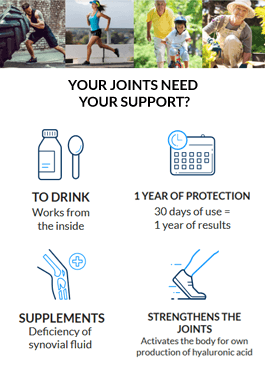 Knee joints are exposed to many kilogramss of pressure every day, so untreated inflammation of the joints can lead to serious consequences in the future, early diagnosis and treatment of the disease will give you a chance to cure completely.